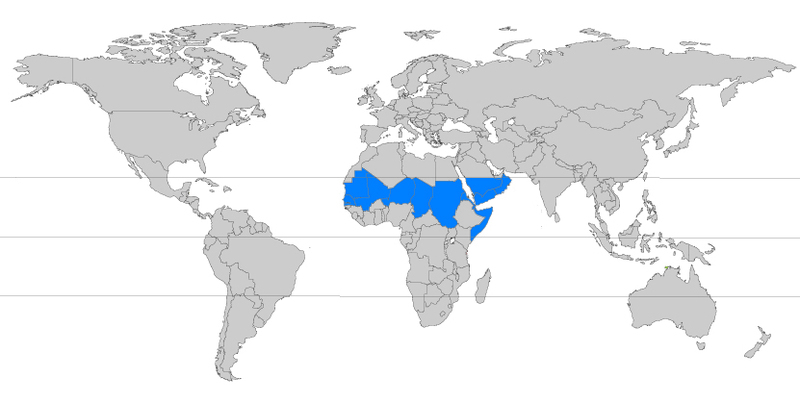 These areas had the lowest proportion of land degraded between 1981 and 2003, reflecting the large expanse of desert area across this region. The primary cause of human induced degradation was overgrazing. Cattle/buffalo holdings increased by 39 million head or 90% between 1980 and 2010, and sheep/goat numbers jumped by 99% or an additional 116 million. Cereal production increased by 159%. However agriculture has declined in its contribution to GDP since 1980 from 26% to 20% in 2010. Industry has grown from 25% to 37%, and it is the only region in the Tropics where industry is the dominant contributor. The contribution of services has fallen significantly over the same period – the only region where this has happened. The region has the second smallest renewable water resource in the Tropics and the largest proportion (54%) coming from external sources. It has the second highest proportion of population vulnerable to water scarcity in the Tropics, up from 18% in 1962 to 62% in 2010. It has become one of the world’s leaders in desalination techniques accounting for more than 60% of global desalination capacity. The region has the biggest improvement in the rate of primary forest loss in 1990-2000 and the lowest proportion of threatened vertebrate species ranging from 1% of amphibians to 9% of mammals. With naturally high dust and aerosol sea salt levels, it has the worst air pollution in the Tropics but the measure has halved since 1990. The number of undernourished people has decreased by 9% but population growth has seen the actual numbers increase from 34 million to 46 million between 1990 and 2012. People living in extreme poverty declined from 53% of the population to 29% between 1991 and 2008 but again actual numbers rose from 30 million to 37 million. Population growth averaged 2.8% per annum in the 30 years to 2010, and economic growth 2.3% per annum. Along with Central & Southern Africa, the region has the highest fertility rates in the Tropics with more than five births per woman, but they are the only regions where life expectancy is less than 60 years, and the maternal mortality rate still remains high. The region had the greatest improvement in the youth literacy rate, with an average growth of 1.9% per annum (more than six times the global rate), although this was from a low base of 52%. It had strong growth in adult mean years of schooling but at only 3.3 years it is the lowest in the Tropics. The number of new TB cases has been increasing since 1990 but the mortality rate has declined by more than 50%. It has the second highest number and rate of new cases and deaths from malaria.